Spring is the official start of construction season. 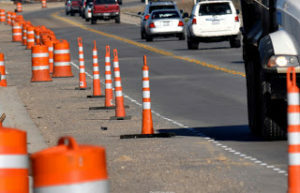 As work zones pop up on roads everywhere, work zone awareness week aims to remind drivers to slow down and be cautious. While speeding in work zones is dangerous, distracted driving can be even more perilous. Drivers who use their phones while driving are used to compensating for their lack of focus. They may keep extra distance between themselves and other cars. Or they may rely on their knowledge of local roads. These mechanisms are certainly not always successful. But in work zones, when roads suddenly narrow and there are new challenges to navigate, distracted driving becomes even more dangerous. Distracted driving is a bad choice. But even distracted drivers can be aware enough to know when more attention than usual is needed. Alerting people as they approach a work zone can be a powerful way to get distracted drivers to put down their phones. Variable message signs can let drivers know that they are nearing a work zone and that distracted driving is about to become a lot more dangerous. Changeable speed limit signs can also alert drivers to lower speed limits. As drivers see brightly lit LED signage warning of construction, they are more likely to put their phones down and get their eyes back to the road. Anytime a driver uses their phone behind the wheel, they are putting themselves in danger. They are also compromising the safety of their passengers, pedestrians, and people in other cars. But in work zones, that risk extends to ordinary men and women who are simply doing their job. In Virginia, where legislation to ban handheld phones has failed, cell phone use in work zones is being banned. 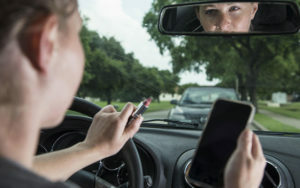 DOT spokeswoman Kamilakas says that’s because “the majority of the crashes that we’re seeing are for distracted driving…” More focused, alert driving can mean the difference between an ordinary day or a life forever ruined. Speed display signs are a great way to alert drivers to their speeds and remind them to slow down. And they work. 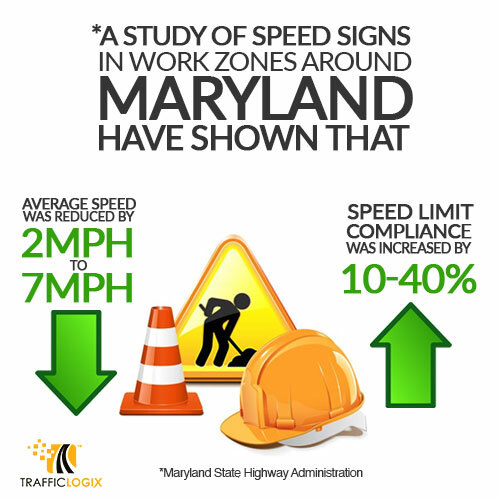 One study of MD work zones found that the average speed was reduced by 2-7 mph and that speed limit compliance increased 10-40% when speed signs were used. But what about when drivers continue to speed or use their phones in work zones? Speed enforcement cameras are another tool that can help reduce driver distraction and speed. When a driver gets a ticket in the mail for work zone speeding, he’s a lot more likely to slow down the next time around.